So what is Nyopoly? It's a pretty awesome website that lets you haggle down the prices of all your purchases, which is amazing 1. because who doesn't like to bring out their inner bargainista and put those deal hunting skills to good use and 2. it puts more moolah back in your pocket in more than one way! You get 20% back in Nyopoly money if your first offer is accepted! Yay all around. They have all kinds of cute stuff up in there but some of my personal picks would be this because every girl absolutely needs a little black clutch and if you are looking to splurge, how pretty is this Badgley Mischka watch? I know. They even have some fancy pants perfumes up for negotiation which always make great gifts this time of year. 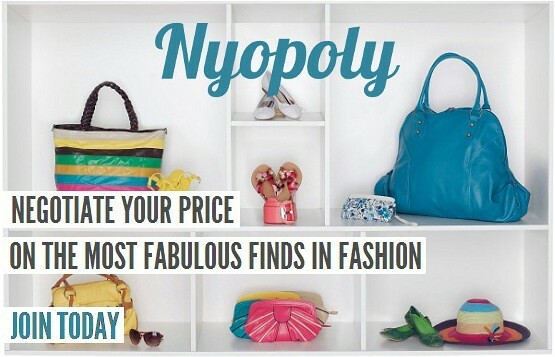 BONUS: Enter to win $50 to Nyopoly here simply by registering. Loads of extra entries available too. Get on it! Winner will be announced in one week. this topic to be actually something which I feel I would by no means understand. me. I'm taking a look ahead in your next put up, I will attempt to get the cling of it! to learn extra of your helpful information. Thanks for the post.